A special journal issue looks at how teams and the spaces they work in contribute to their behavior. One of the world’s oldest academic journals just published a special issue dedicated to studying “collective behavior,” which was assembled by an international group of leading researchers in the field. Philosophy Professor Stephen M. Fiore from UCF, Associate Professor Ecology and Evolutionary Biology Noa Pinter-Wollman from the University of California at Los Angeles, Professor of Architectural and Urban Computing Alan Penn from University College London, and Research Director Guy Theraulaz from the Université de Toulouse in France are co-editors of a special issue of Philosophical Transactions of the Royal Society. The issue takes a broad and detailed interdisciplinary look at the interactions of human to human, mammal to mammal and insect to insect and how their built environments (from their offices to their nests) influence their behavior. For humans, collective behavior is critical as they work on more and more complex tasks that require coordinating their varying forms of expertise by communicating and collaborating effectively to get their jobs done. For example, companies often build “open floor plans” for their employees instead of smaller enclosed offices. 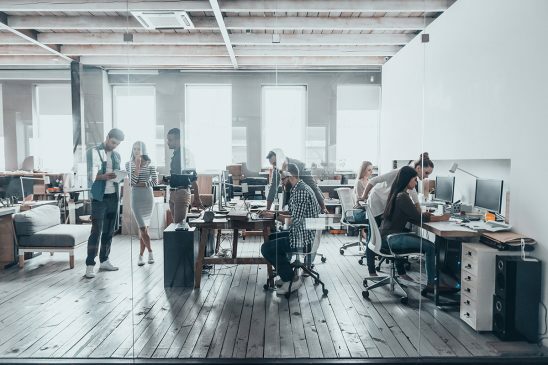 Employers hope that these kinds of spaces will increase collaboration and communication because, for example, people can’t just hide in their offices. But research reported in this special issue shows that open-plan offices actually decrease face-to-face interactions. Another study in the special issue examined how an employee’s physical location in an organization changes collective behavior. That study found that an employee’s access to unique information might depend on the hallway paths around their desk (e.g., are they on the shortest path between other co-workers). This, in turn, can influence their status in the organization, or the prestige of the projects they are assigned. Collective behavior is not limited to humans. Biologists have been studying how insect behavior, like ants, is largely driven by the nests they build. These nests are very sophisticated and designed to include chambers that serve as nurseries and gardens. These rooms and their functions are very complex and not well understood by scientists. That’s why Fiore and colleagues wanted to dedicate a special issue to the topic. The journal’s special issue was supported by a grant from the National Academies of Sciences “Keck Futures Initiative.” The initiative aims to “stimulate new modes of scientific inquiry and break down barriers to interdisciplinary research in funding agencies, academic and other research settings, publication and academia.” Fiore hopes that these methods can be used by scholars in other fields to help us better understand how collective behavior across the animal kingdom is influenced by the environments they build. Fiore is a professor of cognitive sciences with the Department of Philosophy and the Institute for Simulation and Training, and the director of the Cognitive Sciences Laboratory. He joined UCF in 1998 and has multiple degrees including a doctorate in cognitive psychology from the University of Pittsburgh.